You are here: Home / All / Gold Coast accommodation, whale watching, that long beach and more: I’ve changed my tune! 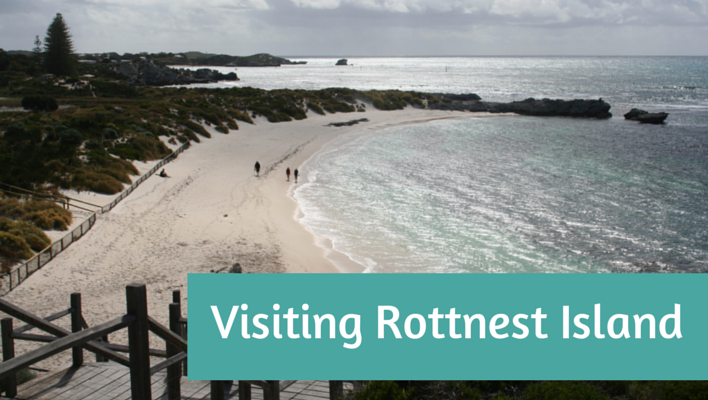 Gold Coast accommodation, whale watching, that long beach and more: I’ve changed my tune! On my last trip to Queensland a year ago (my first as an adult), I wrote about how it the Gold Coast wasn’t really my favourite place. The Problogger conference took me back to the Gold Coast recently and I was determined to have an open mind about it – I figured fate was sending me back there for a reason – and guess what: I like it a lot more! I think this time round I had a better idea of where to go, what to do and where to eat. 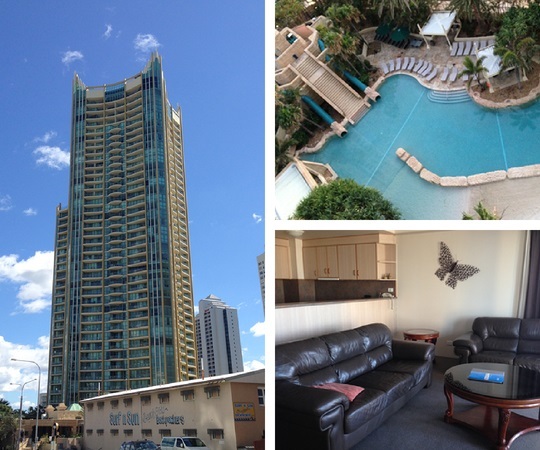 Rather than share a room at the conference hotel venue my roomie Jo and I were keen to use an apartment again for our Gold Coast accommodation. It’s nice to have our own rooms (and bathroom) and to be perfectly honest, it’s nice to have a short walk from “home” to the conference rather than just getting in a lift – the danger is then that we’d never actually see fresh air! I also complained last year about the roadworks and under construction look of the place and this time round they have finally got their tram up and running and most of the roadworks out of the way. A big improvement. There are still a few bits that bother me: do they really need a ride called the Vomatron? (Or couldn’t they just call it something else?) And what’s with King Tut’s Putt Putt golf in the middle of a bit of a wasteland area which, I assume, was at some stage going to become more accommodation? But I’m trying to embrace the tacky angle of the Gold Coast as just another lovable edge. Last year I didn’t schedule in any spare moments aside from the conference, as it was the first time I was leaving my son for so long and I was keen to get home. Surprise, surprise, he survived perfectly fine without me, so this time I added a day so I wasn’t in such a hurry. This was great as I got to enjoy the beach, catch up with friends, and join a whale watching cruise with Whales in Paradise (disclaimer again: I was a guest on the cruise but this is the whole truth and nothing but the truth). 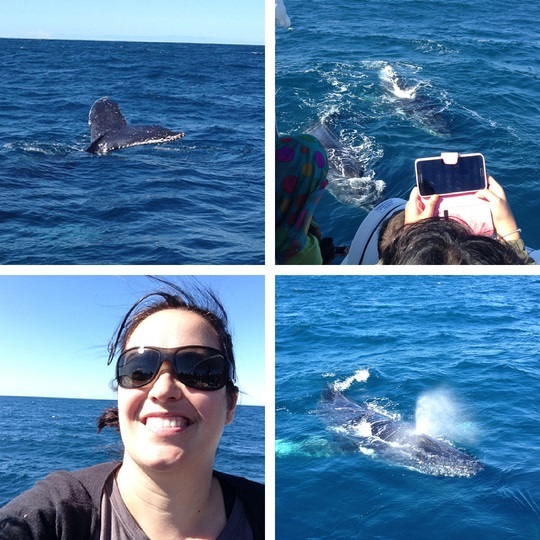 The whale watching trip was A-MAZ-ING! I’ve been whale watching just once before, off Victoria Island in Canada, and it was great, but this trip took it to a whole other level. It was interesting to start off by slowly cruising along the Nerang River to get from the city centre of Surfer’s out to the open ocean, then the captain cranked it up and took us a fair way out to see before we discovered whale central. We were really lucky and there were several pods of whales in one area, and a couple of them took a shine to us and played around our boat. We were actually really late to leave because we physically couldn’t start the boat because the whales were so close. My pictures don’t do it anywhere close to justice – I was too busy actually watching the whales to take many pictures (because, you know, WHALES!) but I highly recommend it. They have some kind of money-back guarantee in case you don’t see whales but apparently that happens basically never. Certainly didn’t happen to us! To be honest, I’m a bit cocky about Western Australian beaches being the best in the world, because really, they’re spectacular, and often empty. However I do now admit that the beach along the Gold Coast is truly spectacular, too. It’s so long and so wide (and so straight! ), and I could have walked up and down it all day. It’s weird to me that there are always so many people walking up and down it with me, but there is plenty of space so it’s not like it’s actually crowded – it’s just more lively than the average West Aussie beach. So there you go. I was wrong last year. This time, I could understand much better why people like going to the Gold Coast. If I was the kind of person who enjoyed theme parks on top of all that, I’d probably really love it. As it is, the Gold Coast will forever have a very soft spot in my heart as the place where I won all those frequent flyer points, something that will really change our travels over the next couple of years. Thanks, Gold Coast, see you again sometime! 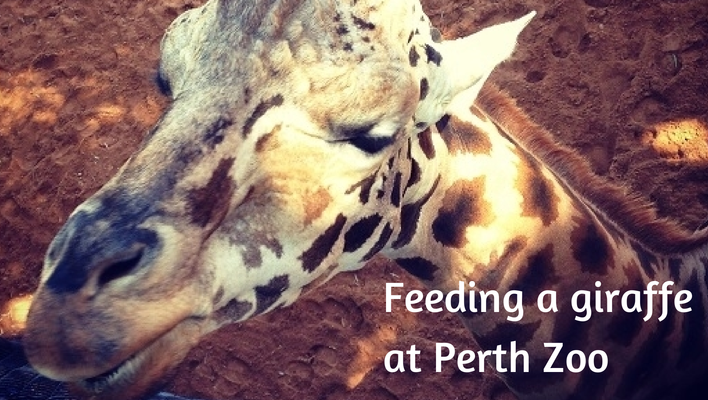 Feeding giraffes at Perth Zoo: Like travelling in your hometown Things to do in Tasmania with a toddler: Our itinerary and tips for 10 days in Tassie Should you visit Rottnest Island for a day trip or overnight? No contest! 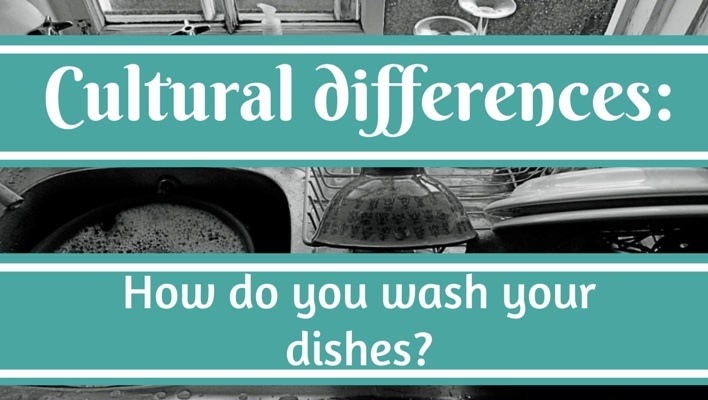 Unexpected cultural differences: How do you wash your dishes in your country? I loved this story of your stay at the Gold Coast this year. I think you’ve been honest and fair bringing in the good, the bad and the somewhat ugly. At the end of the day I reckon Surfers Paradise has a spirit to it … the spirit of a loooooong stretch of beach and a place where it’s traditionally been possible, and still is possible, to just kick back and relax. So glad you had a great time Whale Watching. So sad the Vomatron is still called that! So very privileged to have been your roomie. Oh dear you had me cracking up at the Vomatron!!! I wondered that about King Tut’s too…weird! I would love to go whale watching so I should ad that to my list (yes there is a travel one too). Haha I’m so not surprised that you have a travel list! And yes whale watching needs to be on it. The Vomatron is hilarious, right? In a glad-it’s-not-in-my-town kind of way. Sounds silly but I never knew there was whale watching on the Gold Coast! Definitely something to try when there next. Totally agree Nicole, that’s the second (very accessible) Mantra we’ve stayed at on the Gold Coast and they’re great. 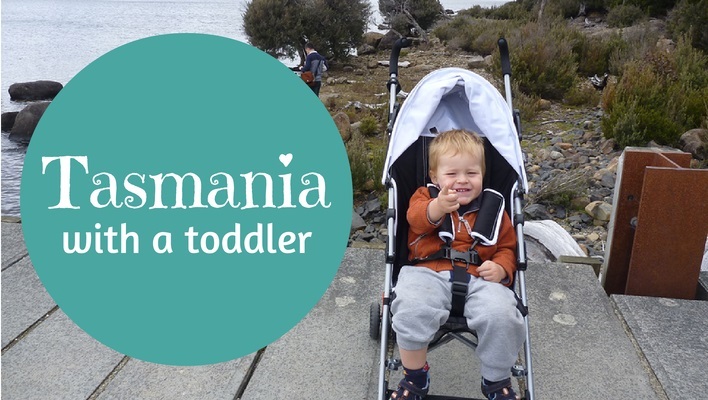 And it is definitely not silly – I didn’t have any idea you could go whale watching there either!! So great though. So glad you and Jo enjoyed the Gold Coast. I tried to be open-minded and see if there was something that I had missed on my one and only visit. I don’t think so. However, thanks for an entertaining fead. Haha thanks Denise – I certainly enjoyed it a lot more but I wouldn’t be suggesting anyone put it at the top of their must travel to list just yet. But it was much lovelier this time round.